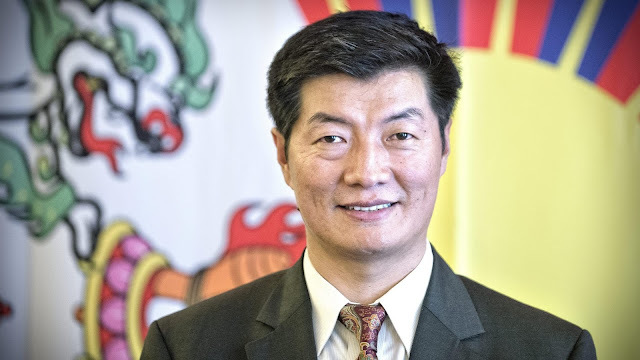 Lobsang Sangay, president of the Central Tibetan Administration, is increasing the efforts to raise awareness about the deteriorating human rights situation in Tibet. Recently he visited Scandinavia and Canada and last week he visited the United States to discuss the Tibet issue and the U.S.-China bilateral relationship. Globcal International's Goodwill Ambassador Maria Veneke Ylikomi had the great honour to interview Lobsang Sangay, or "Sikyong" as his Tibetan title is, during the president's visit in Sweden. The interview was made for the Swedish magazine Gränslöst, with the theme of human rights, democracy and tolerance. News about justice – for all. "What we say is that we want to walk with the Chinese government, we want to talk with the Chinese government and we want a mutually acceptable solution with the Chinese government. It is to seek genuine autonomy as per Chinese laws for the Tibetan people", said Lobsang Sangay. Sikyong studied International Law at Harvard Law School in the United States. In 2011, he got elected as president of the Tibetan-government-in-exile, Central Tibetan Administration, based in Dharamsala, India. "I spent 16 years in America and learned quite a bit. And 2011 I ran for the election. I didn’t think I would win, my mother didn’t think I would win, no one thought I would win, but I won. And then I decided to move to India, to leave Harvard and leave my job in America. I didn’t find it that difficult, mental adjustment." Tibet’s President in exile, Dr Lobsang Sangay, or “Sikyong” as his Tibetan title is, visited Sweden on November 14–15. The Swedish visit was arranged by the Swedish Tibet Committee together with the Tibetan Community in Sweden. The President had a hectic program during the two days in Sweden. The magazine Gränslöst received an exclusive interview with the Tibetan leader. It is a sunny morning in November when Gränslöst meets Lobsang Sangay at a hotel in Stockholm. He talks about the challenges that the Tibetan people are facing. He says that human rights violations are the most pressing issues today. – There is political repression, cultural assimilation, environmental destruction, social discrimination and economic marginalization. As an example of cultural assimilation, Sikyong mentions the Tibetan language. – The Chinese law says that Tibetan language should be not only used but should be encouraged. But in practice, it is discouraged and not used. Lobsang Sangay says that 150 Tibetans have burned themselves to death. – Few young students burned themselves saying we want to use Tibetan language in Tibetan schools. That is severe. Lobsang Sangay explains that Tibet totally lacks independent media. – Reporters without Borders have said that it’s more difficult to have access to Tibet for journalists than North Korea. So, if you try to get a visa as a journalist to go to Tibet, Chinese Embassy will say no, you cannot go. Lobsang Sangay thinks that the water issue is very important not only for Tibet but for the whole Asia. – Tibet is called the water tower of Asia. The ten major rivers of Asia flow from the Tibetan Plateau. As examples of rivers flowing from Tibet, Sikyong mentions the rivers Indus, Brahmaputra, Mekong, Irrawaddy, Yangtze and Yellow River. – Yellow River is the cradle of Chinese civilization. 1.4 billion people depend on freshwater flowing from Tibet. So it’s very serious. China has 19 per cent of the world population but only 12 per cent of freshwater, which means already 400 million Chinese are facing scarcity of water. The situation in other parts of Asia is bad. Sikyong explains that China wants to divert the Tibetan rivers to the inner parts of China. – There was one report that they want to divert Brahmaputra River, which is a lifeline for northeast of India and Bangladesh. They want to divert to Xinjiang, which is a very dry area. If that river is diverted, millions of people in northeast of India and Bangladesh will suffer. The Tibetan Plateau is sometimes called “The Third Pole”. – After Antarctic and Arctic, Tibet has the third highest reserve of ice. And Tibet also acts like the cooler or the refrigerator of the world. It is so high and so cold, covered in snow. Tibet has 46 000 glaciers. Nasa says, by 2100, one third will disappear, or even as high as two thirds will disappear. If two thirds of Tibetan glaciers disappear, what will happen to 1.4 billion people who are depending on water from the Tibetan Plateau? It is a very serious issue. One scientist in University of California said “if you want to understand climate change and global warming, it won’t be complete without understanding the Tibetan Plateau”. Sikyong says that Chinese environmentalists are proposing to declare Tibet as the Third Pole National Park. – Chinese government is not listening, so all the big companies are exploiting mineral resources of Tibet. And they are also exploiting all other kinds of minerals, cutting down trees and building a lot of hydro projects in Tibet regions and rivers. It is Chinese companies and Chinese leaders and officials who are profiting from all this kind of businesses. Lobsang Sangay explains that deforestation causes natural disasters and floods. – The Tibetan Plateau affects the climate all the way to Europe, whether the Sweden winter is cold or warm, whether there is heat wave in Europe or not, is partly determined by the climate change on the Tibetan Plateau. So the Tibet issue is a global environmental issue. For the Tibetan leader Lobsang Sangay, Gandhi’s non-violent philosophy, ahimsa, is the right way to go. – There is so much violence already in the world. If you can solve the issue, any issue, based on ahimsa and non-violence, it is always good. We are advocating this. There are people who are interested, there are people who are supportive, but unfortunately the Chinese government and Chinese leaders are not listening, so that’s where the challenge is. Sikyong explains that Tibetan Buddhists are not given the right to peaceful demonstrations. – Larung Gar monastery had 12 000 monks and nuns. From last year August to this year August, it was destroyed and reduced to 5 000 monks and nuns. 7 000 were expelled. Three nuns committed suicide. So you can clearly see, peaceful demonstration by Buddhist monks and nuns is impossible. Larung Gar and the surrounding mountains are surrounded by troops. Sikyong believes that rise of nationalism is a global challenge. – There is decrease in internationalism and there is rise of nationalism. In North America, Europe, Asia, it is a reality. And the Chinese nationalism is a new thing. So how we handle that is a big test. That’s the big challenge for the globe, for the whole world. We must continue the path of internationalism and liberalism. The world is getting smaller in the sense we all are integrated, the borders become porous, are intermingling. The liberal pulse is the best way to go. The rise of nationalism and extremism is creating more obstacles for general peace and harmony in the world. Lobsang Sangay’s parents fled to India from Tibet in 1959. – I grew up in a small village, in a place called Darjeeling. Darjeeling is known for tea. But I was not from the town. I was from the village. My family did not have much, only one acre of land, two–three cows, one dozen chicken. On my winter vacation I cut grass for cows, cut wood for home. I went to a refugee school, studied hard and worked hard. Later in life, Lobsang Sangay received a Fulbright Scholarship to study International Law at Harvard Law School in the United States, where he got a doctorate degree. In 2011, he got elected as President of the Tibetan-government-in-exile, based in Dharamsala, India. He left America, Harvard, and went to Dharamsala to work for the Central Tibetan Administration. – Since childhood, when you hear the stories from your parents, how much they suffered, how difficult it was, that inculcate some sense of responsibility in you. Sikyong explains that His Holiness the Dalai Lama is a good helping hand. – He thinks I am doing okay, helping the Tibetan cause. I meet him regularly. Just one week before I travelled to this part of the world, I met him twice in one week. I inform him and he advise me, so I get to meet regularly. He is a good support for me in everything I do. In conclusion, Sikyong says he likes nature. – I like forests, I like mountains, I like fresh air. And I like cows. Gränslöst (borderless/limitless in the Swedish language) is a Swedish magazine with the theme of human rights, democracy and tolerance. News about justice – for all.